Juliet E. Mckenna is the author of several bestselling fantasy series, including The Chronicles of the Lescari Revolution, and her new series, The Hadrumal Crisis, which begins with Dangerous Waters, released in bookstores this month. Download a free Hadrumal Crisis short story by Juliet, or find out more about her work at her official website, on Amazon, and on Twitter. People can be surprised when they ask what good books I’ve read lately and I offer urban fantasy titles. I write epic fantasy; the affairs of kings and wizards, full of conflict, politics and power, and their human impact. 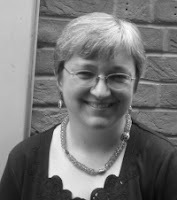 I write those books because I love all that high historically-influenced drama. So why don’t I read all the splendid writers published nowadays? Well, I do read high epic fantasy but only when I’m on holiday. While I’m actually working on a book myself, I cannot set aside the analytical writer’s mindset unless I’m reading to write a review in which case that mindset is ideal. But to switch off and immerse myself in an epic secondary world? These days I have to be right away from my own work. Urban fantasy though, is sufficiently different from my own writing. It also offers so much of the enjoyment and thrill I have always got from crime fiction. 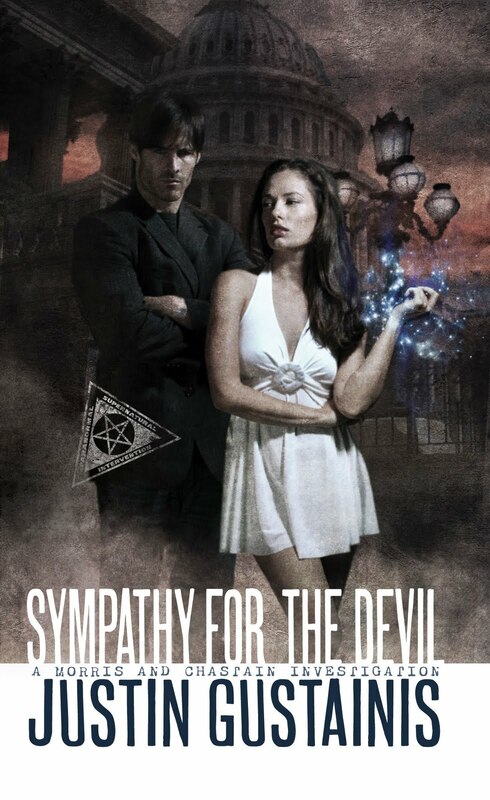 So I’ve been celebrating the publication of my own new book by reading Sympathy for the Devil, by Justin Gustainis. 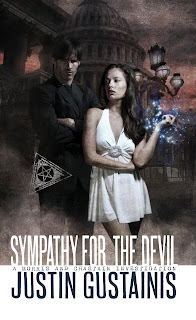 The third of his ‘Morris and Chastain Investigations’, this sees white witch Libby Chastain and supernatural investigator Quincey Morris caught up in the US presidential race. There are always concerns about candidates being in thrall to special interest groups; unions, big business, extremists on right and left. How much more worried would you be at the thought of the White House really going to Hell in a hand basket? As with his two previous stories, Black Magic Woman and Evil Ways, Gustainis takes an apparently straight-forward idea and really tests that premise, his characters and the readers with a thrilling plot that never ducks the hard choices. Morris and Chastain are convincingly complex characters who know the folly of hoping for easy answers. Their different perspectives, their secret parallel world, their allies and their enemies, are all made ominously plausible thanks to Gustainis’ astute eye for logic and telling detail along with timely pop culture references and a canny sense of humour offering lighter touches to enhance the darkness. Imagine my delight when I discovered he’s also got a new book coming from Angry Robot. Hard Spell flips the coin completely; a first person narrative by Stan Markowski, a Scranton, Pennsylvania cop in a world where supernatural creatures are openly acknowledged. See a crime involving one? Dial 666. Here the quest for power is far more local and personal, though just as potentially disastrous for the human race, while the cost to individuals amid the inexorable demands of the bigger picture makes this a story about real people, just the wickedly funny riffs on TV cop shows and mystery fiction raise a smile. Over on the west coast of America, I’m enjoying Patricia Briggs’ ‘Mercy Thompson’ series, from Moon Called to the latest, River Marked. These are fast-paced, exciting thrillers with a personal focus on Mercy, who’s a coyote shape-changer, and her relationship with Adam, alpha werewolf of the local pack. But don’t make the mistake of thinking these are sappy paranormal fang-banger romances. Mercy is a car mechanic and that’s very far from a token gesture to female empowerment. Along with the thrills and chills, these books explore the nature of power and its use and abuse within all the relationships which we become entangled in, through choice, accident, family and love, platonic and sexual. Those same subtexts add similar depth and substance to Kelley Armstrong’s ‘Otherworld’ series, which I’ve been enjoying since the first book, Bitten. 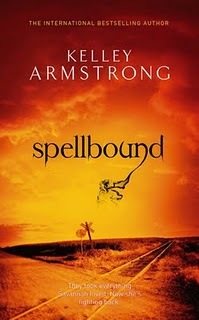 I’m really looking forward to the next instalment, Spell Bound where young witch Savannah Levine discovers that the only thing worse than having occult powers is not having them. I have no idea what Armstrong is going to do with that twist but I can’t wait to find out, and to see which other characters from her series help Savannah out. A particular strength of this series is the wide-ranging cast of different women and men whose stories explore so much of this world and the pressures on us all in the here and now; cash and careers, life-work balance, familial expectation, through these adventures in parallel realms. Where these series mark the boundary between thrillers and urban fantasy, Charlie Houston’s Joe Pitt casebooks stray into real horror territory, this time in Manhattan. A reader needs a robust frame of mind to see the story through from Already Dead to My Dead Body. These stories are uncompromisingly bloody though not entirely unremittingly grim. That’s what saves them from crossing the line from exploration of violence and cruelty to mere exploitation. Once again, the nature of power is studied and most of all, what happens to people when they believe there can be no consequences, or just as deadening, no hope, whatever they might do. In this context, such harsh urban fantasy has at least as much to say, if not more, than the slasher/serial killer sub-genre of crime fiction these days. I don’t only read US based urban fantasy. Mike Carey’s Felix Castor novels, from The Devil You Know onwards offer a bleakly believable vision of London slowly coming to terms with the emergence of ghosts and other things that go bump in the night. Felix has the power to exorcise ghosts and if he gets the chance, worse. Though it turns out that demons are none too keen on being sent back whence they came and have no conscience when it comes to using and abusing humans tricked by their promises and/or trapped by their own folly. Add those who would exploit Felix’s powers for their own purposes, whatever the cost to him, and the police who are just trying to manage the body count, and these are some very mean streets for a man to walk down. 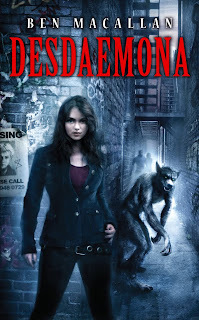 Even more distinctively British, Ben Macallan’s debut novel Desdaemona opens in a small town bus station where Jordan finds Sarah, another runaway teenager who’s about to be eaten by werewolves. She has no idea what to do but he does, because what he’s running away from is far, far more deadly. This is what Jordan does; he keeps on running and while he’s doing that, he saves other lost and vulnerable people when and where he can. For a whole lot of reasons, he’s far older than his seventeen years. So what is he to do when Desdaemona finds him in an end-of-season seaside cafe and asks for his help finding her lost sister? Because only Jordan understands the perilous world which these girls were seduced by and just how relentless the pursuit will be now that the powerful and the personal have found themselves at odds. That’s all very well but the danger is that Jordan’s own enemies will pick up his scent if they’re on the same trail. Urban fantasy can only convince with the ‘urban’ when the real-world setting is a three-dimensional, fully sensory environment. It will never convince with the fantasy if all it delivers is variations on cliché monsters. Macallan delivers. The story takes us to London but it’s events in Henley on Thames that truly anchor the dread in the Thames Valley. There are werewolves and such but it’s evil drawn from English myth that chills all the more thoroughly as half-glimpsed folklore is woven into the modern world of back alleys and refuges for runaways and outcasts. Above all else, the people must convince. They must be more than ‘characters’; living, breathing, loving, fearful. Even when they might not even be people at all, we must care about their fate. You will. The use and abuse of power, in life and love and everything in between. Lies and self-deception. The cost of sacrifice and of ambition, for the individual and for those around them. The lingering effects of dramatic events on those swept along, innocent and guilty alike. The full gamut of human experience is explored in urban fantasy. Just as it is in epic fantasy. Just as it is in the books I write. After a dozen books in the Einarinn timeline, I’ve found the rights and wrongs of using wizardly power have come to the fore in the Hadrumal Crisis trilogy. Can the Archmage evade the hard choices? What happens if he does? What will the mainland rulers do if he refuses to help them? What will the consequences be? What are the costs to a wizard of pursuing magic above all else? What is the ultimate price of devotion for a loving wife and a loyal guardsman? In the final analysis, all fiction that’s worth reading explores the human condition. Only the details differ. Thankfully urban fantasy differs just enough from the epic to give me such great books to read while I’m working on my own stories. Sounds interesting. I'm always looking for new books to read. I like the human condition. All opinions stated here are the bloggers' own, and do not necessarily reflect those of their employers... or clean-living, reasonable persons.